Everybody knows this, but it’s true: the best way to lose weight is to increase the amount of physical activity you take while reducing the fat and sugar you eat. Most of us find this very difficult – and going on a highly restricted calorie controlled diet is extremely hard work. However, if you use the food pyramid to ensure you eat the minimum number of servings from the five food groups you’ll find that it’s easier to manage this process as the right blend of grains, vegetables and fruits, proteins and dairy will make you feel satisfied and give you the nutrients you need to get through the day. 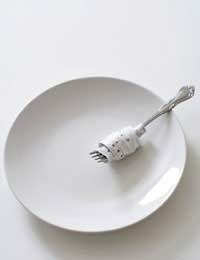 Nobody should stay on a 1200 calorie diet for more than a few weeks, and it should be undertaken, ideally, with medical supervision, but if you feel this is the right diet for you, the information below helps you work out the amounts of each food group you can eat and stay within your calorie limit. Always try choose the lowest fat, salt and sugar options in any food group. Change your plate size – buy a dinner plate an inch or so smaller than you are used to and use it for the period you are limiting your calorie intake. It will fool your eye that your plate is as full as usual, so you won’t get ‘eye’ hunger, which is what happens when you see gaps on a plate that we’re used to seeing filled. Take care with drinks. One serving of fruit juice in the food pyramid guidelines is 170 ml, but many drinks that you buy in shops are sold in bottles that are two and half times that size, meaning that you take in two and a half times as many calories. Pour your juice into a jug so that you don’t have more than 200 ml at a serving. You can eat 100 grams of grains on a 1200 calorie diet. Each of the following adds up to 25 gram portion: 25 grams dry pasta or rice or 1 slice of wholegrain bread or half a muffin. You can also have 25 grams of low sugar cereal or 25 grams of porridge made with water – if it’s porridge made with milk remember to factor the milk into your 1200 calories as detailed below. The 1200 calorie diet would allow you to eat three servings of vegetables, and a serving in this case is a cupped handful of chopped raw or cooked vegetables, 170 ml of vegetable juice, or two cupped handfuls of salad greens or uncooked spinach. Two servings of fruit would be allowed on a 1200 calorie diet and this serving would consist of a cupped handful of chopped raw or cooked fruit, or 170 ml of unsweetened fruit juice. Dairy foods can be high in fats and if they are cheeses they may be high in salts while flavoured yoghurts and other milk desserts can be very high in added sugars, so it is important to read food labelling in these cases. Two portions of dairy food are allowed on a 1200 calorie diet and this could be 170ml skimmed milk, 35 grams of cheddar or 50 grams of cottage or cream cheese. It is best to aim at lean meat such as poultry or oily fish, and in either case a 75 gram portion is allowed, or alternatively one serving would be one egg, or 25 grams of cooked beans or tofu, one heaped tablespoon of peanut butter or 12 grams of nuts. On a 1200 calorie diet, its important to try and ensure you get around 17 grams of ‘good’ fat from your overall diet, not in addition to it and that fat should come from polyunsaturated and monounsaturated fat, such as oily fish, nuts, and vegetable oils. If you can stick to the above guidelines you should have around 150 calories left over at the end of every day to give yourself a treat.